Top performers have superior crop sequences to their peers. They make the best use of rainfall, the soils ability to store moisture, and crop choice to achieve high gross margin in the environment they operate in. This is matched with good people and business management skills. Cost management assists profitability on the Top 20% of farms, while teamwork, labour, safety and machinery decisions are also important. The top performing farms (the Top 20% as ranked by Return on Assets Managed or ROAM) in the northern grains region achieved almost twice the profit of the average farms in the Agripath datasets compared over two or three years. 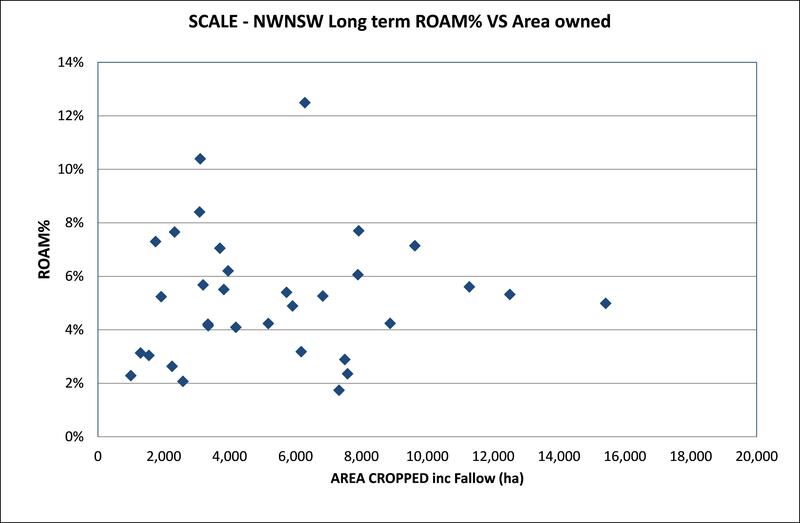 For the larger farms in the western and central zones, ROAM averaged just under six per cent, while the top farms achieved a profit equal to 10 per cent ROAM. Average profit on smaller farms in the higher rainfall areas, with higher land values was four percent ROAM while the Top 20% achieved 7.3 per cent over the three years. By comparison the ABARE surveys of farm profit showed an average return on investment of 2.2 per cent for Queensland farms growing wheat and other crops over the same period, while NSW cropping farms averaged 2.7 per cent return. In dollar terms these differences translate into as much as $440,000 per year in additional profit for an average sized farm in the Agripath dataset. The potential to improve profit for most farms is an enormous opportunity to be explored. Figure 1: Long term return on assets managed for farms in NW NSW. Farm size or area cropped was not an important factor in profitability (Figure 1), with the Top 20% of farms slightly smaller than average on the whole, but with slightly larger area of crop. A small part of the profit difference therefore, is the dilution of crop profits with generally lower profits from beef cattle. There is potential to significantly improve farm profits in the northern region if farmers can fine-tune their farming systems and agronomy, and combine this with good management of machinery, labour, finance and the timeliness of operations. Of these gross margin is the most important. Businesses that operate on low margin are unable to create sufficient surpluses to meet overheads, interest costs and drawings which average over $190/ha for the average farm in the database. Successful businesses are built on a sequence of crops that consistently produce high margin (Figure 2). 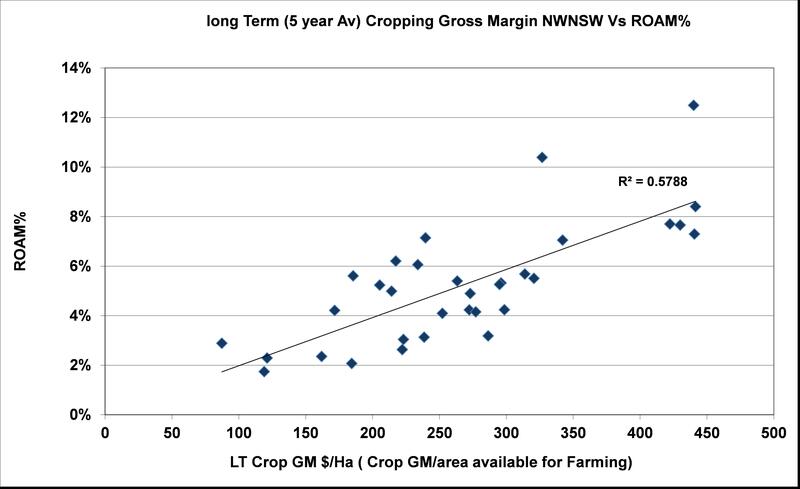 Figure 2: Long term (five year average crop gross margin) versus ROAM%. Optimising direct costs, yield, marketing, low cost business model, management and risk management are all essential components that result in a high gross margin business. Crop frequency and the planning of crops in accordance with soil moisture is an important part of decision making in northern crop growing regions. A high frequency of low yielding crops, with small margins may be less profitable than a well-planned rotation which includes some crops grown on long fallow during the change between summer and winter cropping. An example of less profit from double cropping when changing from a sorghum crop to a winter crop, compared to a long fallow is shown in Table 1. A double-crop of chickpea with a yield of 1.0t/ha followed by wheat yielding 2.5t/ha might appear profitable, but they only have a combined margin of around $200/ha. A wheat crop on a long fallow with a yield of 4t/ha, would have a margin close to $400/ha and could help to improve overall farm profit. Good margins are important and too much opportunity cropping can result in reduced margins and more income variability over the long term. Table 1: Margins from a double-crop sequence compared to a long fallow. Apart from good moisture storage, the main difference between average and top crops is the effect on yield by a number of ‘profit draggers’, such as disease, nematodes, weeds, low nitrogen, timeliness or harvest losses, which in combination affect yield by 20-30 per cent and drag down profit by 50-60 per cent. To manage well requires attention to all the profit draggers, but there is also a need to put time and effort into crop selection and managing rotations, crop frequency and risks. Cost management assists profitability on the Top 20% of farms, while teamwork, labour, safety and machinery decisions are also important. Top performers have built high gross margin based businesses, their crop sequences are superior to their peers in that they make the best use of rainfall, the soils ability to store moisture, and crop choice to achieve high gross margin in the environment they operate in. The sequence of crops chosen addresses agronomic issues and reduces costs. This is matched with good people and business management skills.